IntakeQ allows you to create superbills based around your client's appointments, the services they received, and the diagnosis noted. Navigate to "More > Settings > Features". 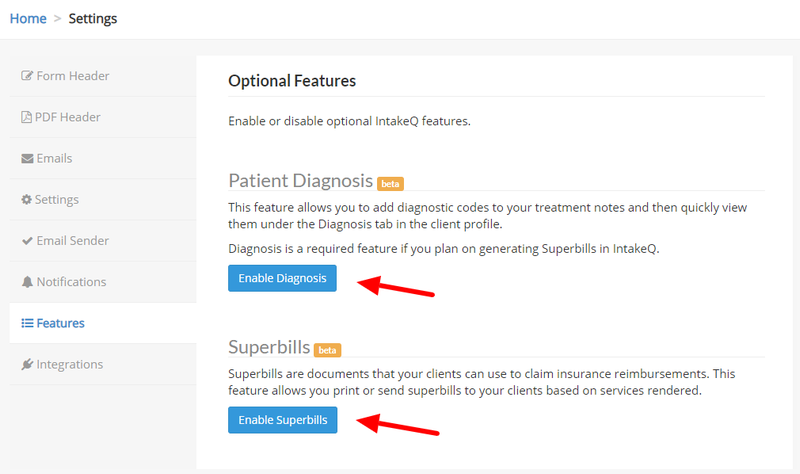 Click the "Enable Diagnosis" and "Enable Superbills" buttons as both features are required for superbills (see image below). Navigate to "List > Invoices > Invoice Settings". 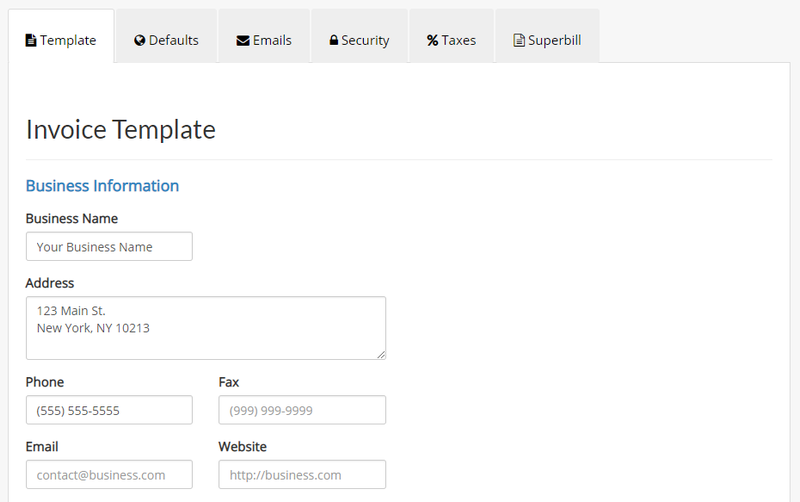 On the "Template" tab enter information for at least the fields "Business Name", "Address", and "Phone", we'd suggest completing the others if applicable as well. 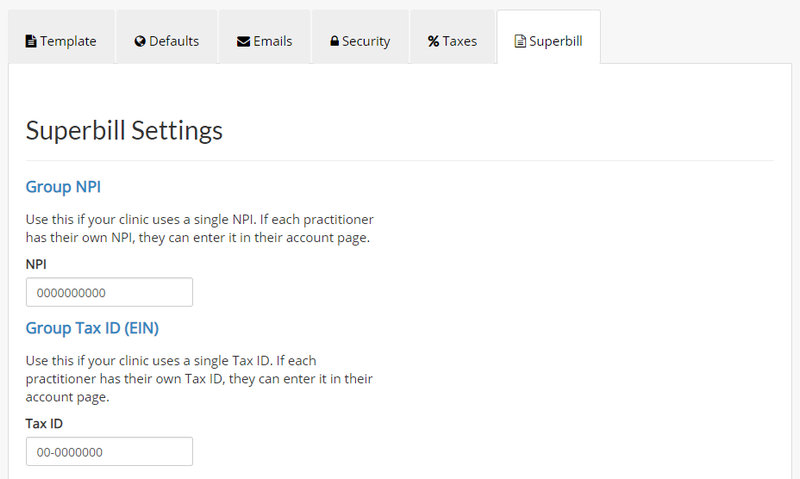 On the "Superbill" tab enter information for "NPI" and "Tax ID". Login to the specific practitioner account that you want to override the default settings on. Navigate to "More > Account". Under the "Clinical Information" section you'll see that you can enter your NPI, Tax ID, and Licenses. Click "Save" at the bottom of the page to save these settings, they will override the defaults for the clinic and appear on superbills generated by that specific practitioner. Navigate to "Lists > Invoices > Invoice Settings". Go to the "Superbill" tab. Under the Diagnostic Coding section, click "Manage Diagnosis Codes". You'll be presented with the following screen that gives you various options for managing your diagnosis codes. Add New Code: This option will allow you to create a diagnosis code and give it a description. Once added it will appear in the list as you see in the above image. 1: Click this icon to edit an already existing diagnosis code. 2: Click this icon to delete an already existing diagnosis code. Navigate to the client profile via "Lists > Clients", selecting the client you wish to add diagnosis codes to. From the "Timeline" on the left side of the screen you either need to select an existing treatment note (shown in blue) or create a new one. You can also add diagnosis codes to the pinned note. With a treatment note open, make sure you're in edit mode. The button beside "Saved" on the upper right will say "Lock", if it doesn't click on "Edit" to enter the edit mode. To add diagnosis codes to the treatment note, click "More" (grey button) and select "Add Diagnosis". You'll be presented with a similar screen that you would have saw when managing your diagnosis codes. You can add new ones or edit existing ones if needed here. To add a diagnosis code to the treatment note, simply click on it's box (the box turns yellow when you mouseover it, this is where you click). Repeat Step 5 if you want to add multiple diagnosis codes to the treatment note. Once added you'll see them listed at the top of the treatment note like in the image below. If you need to remove them from the treatment note, simply click the "Remove" link beside the ones you want to remove. Remember to lock the treatment note when you're finished by selecting "Lock" from the upper grey menu. Now that you've added diagnosis codes to the client, you'll be able to easily see them from the client's timeline under the "Diagnosis" tab. You can quickly access the specific treatment note that a diagnosis code was added to from this screen by clicking "open note" as seen below. Under the Procedure Codes section, click "Manage Procedure Codes". You'll be presented with the following screen that gives you various options for managing your procedure codes. Add New Code: This option will allow you to create a procedure code and give it a description. Once added it will appear in the list as you see in the above image. 1: Click this icon to edit an already existing procedure code. 2: Click this icon to delete an already existing procedure code. Navigate to "Bookings > Booking Settings > Services". Click "Edit" beside the service you'd like to modify and go to the "Superbill" tab in the dialog. First you'll see an option to set the "Place of Service", below that there is an "Add Procedure" button to add procedure codes to the service. 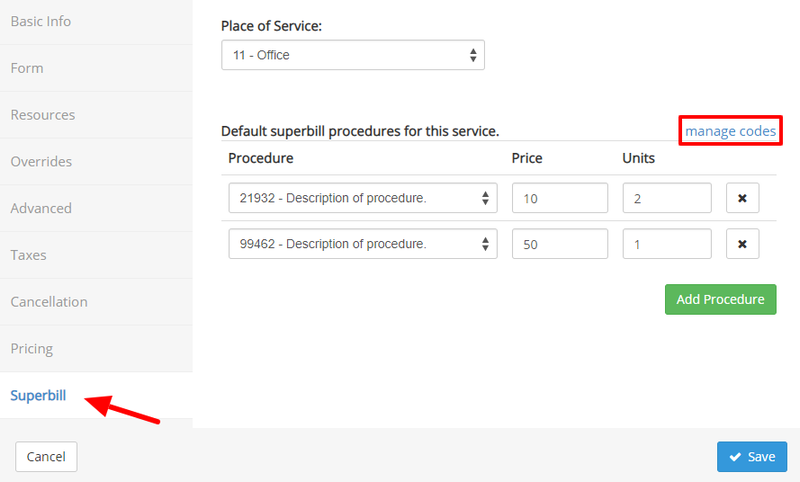 You can add multiple procedure codes to each service, set the cost of each and the amount of units. Click the "manage codes" link to manage your procedure codes if needed. When finished click "Save" and this information will now be associated with your service. 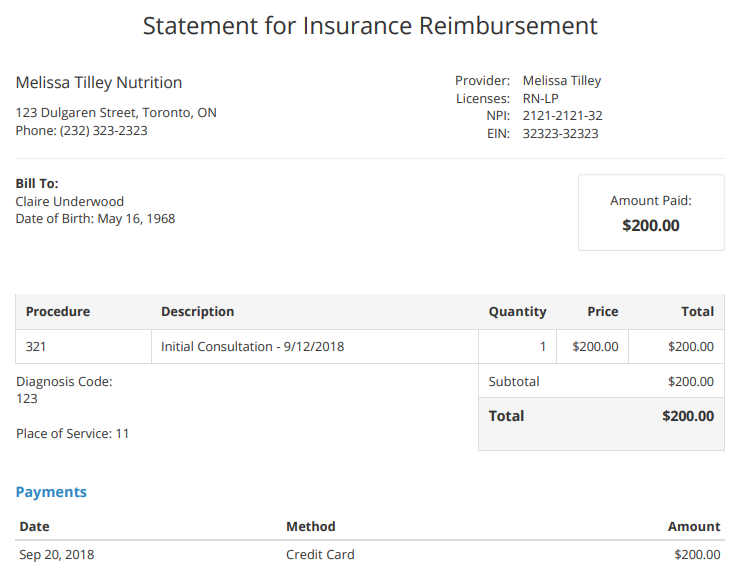 Navigate to "Lists > Invoices" and open the invoice you want to generate the superbill for (you can access invoices from the client profile or from appointments as well). Click on the "Superbill" button in the lower left corner of the invoice window. In this menu, select "Superbill Details". 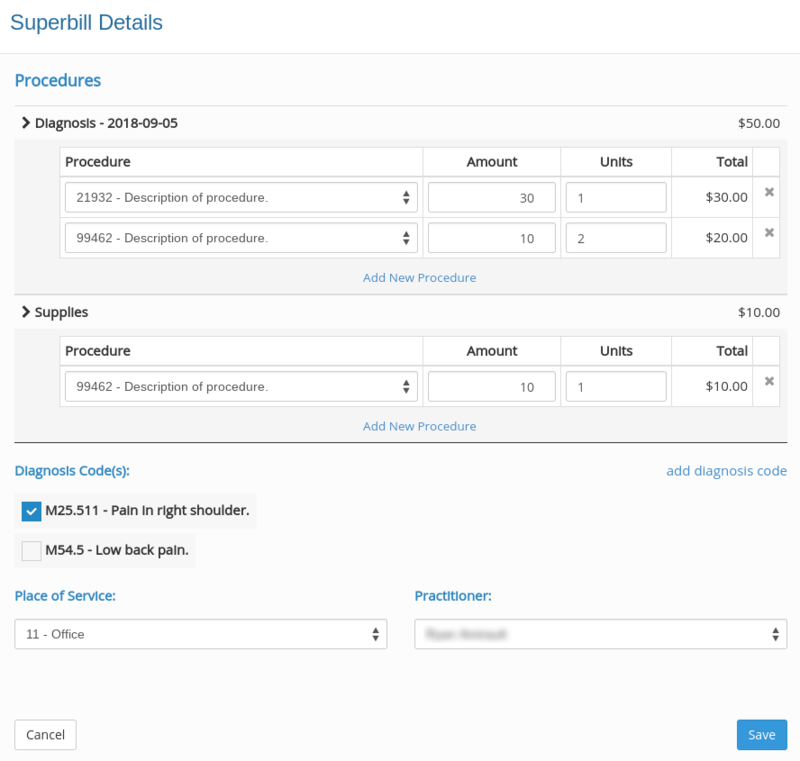 You can now select the diagnostic codes applicable to the superbill (click on "add diagnosis code" to add new codes), the place of service, and one or more procedure codes for each line item on the invoice (see image below for an example). Some of this information will be pulled from the appointment and client diagnosis (if applicable), but it can be customized on this screen if needed. You can have multiple procedure codes per line item, and can also specify the print and units for each procedure. Click "Save" when you are finished setting up these superbill details. 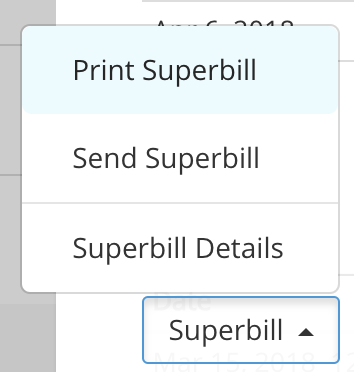 In the "Superbill" menu, you can now choose to print/download the superbill as a PDF, or send it to a client via email or the secure client portal. Click on the speech bubble located on the top menu. Click on the "Settings" button located on the top right corner of the page. Open the "Portal Features" tab. Enable the invoice feature and the superbill feature. Once enabled, your clients will see a "Superbill" link for each paid invoice (as shown below). Please note that superbills that are missing the required information (diagnosis, procedure codes, etc.) will not be generated. If the client attempts to generate one, they will receive an error message saying that the superbill is not ready. Here is one example of what the PDF printout would look like for a superbill. If you'd like to add a custom message to the bottom of your superbill PDFs, you can do so from "Lists > Invoices > Invoice Settings > Superbill", in the section titled "Superbill Bottom Text (PDF)". If you need assistance with anything, please contact us and we'll be happy to help!